On the evening of April 14, 1865, John Wilkes Booth, a famous actor and Confederate sympathizer, assassinated President Abraham Lincoln at Ford’s Theatre in Washington, D.C. The attack came only five days after Confederate General Robert E. Lee surrendered his massive army at Appomattox Court House, Virginia, effectively ending the American Civil War. John Wilkes Booth was a Maryland native born in 1838 into a family of noted actors. Booth would eventually take the stage himself, appearing in 1855 in Shakespeare’s Richard III in Baltimore. Despite his Confederate sympathies, Booth remained in the North during the Civil War, pursuing a successful career as an actor. But as the war entered its final stages, he and several associates hatched a plot to kidnap the president and take him to Richmond, the Confederate capital. On March 20, 1865, the day of the planned kidnapping, Abraham Lincoln failed to appear at the spot where Booth and his six fellow conspirators lay in wait, foiling their planned abduction. Two weeks later, Richmond fell to Union forces. In April, with Confederate armies near collapse across the South, Booth came up with a desperate plan to save the Confederacy. 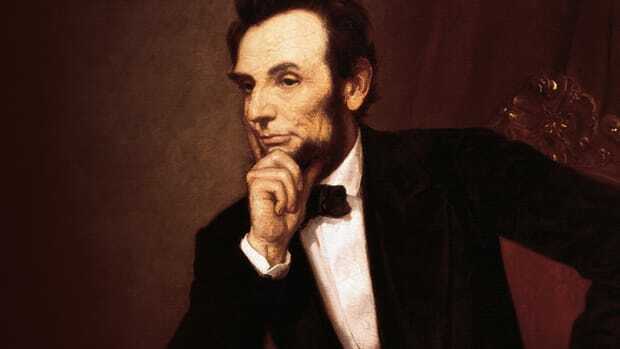 Learning that Lincoln was to attend Laura Keene’s acclaimed performance of “Our American Cousin” at Ford’s Theatre in Washington, D.C., on April 14, Booth masterminded a plan even more diabolical than kidnapping. He and his co-conspirators believed the simultaneous assassination of Lincoln, Vice President Andrew Johnson and Secretary of State William H. Seward–the president and two of his possible successors–would throw the U.S. government into disarray. The Lincolns arrived late for the comedy, but the president was reportedly in a fine mood and laughed heartily during the production. 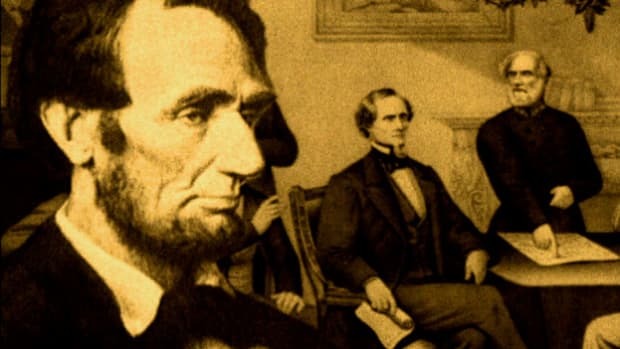 Lincoln occupied a private box above the stage with his wife Mary Todd Lincoln, a young army officer named Henry Rathbone and Rathbone’s fiancé, Clara Harris, the daughter of New York Senator Ira Harris. At 10:15, Booth slipped into the box and fired his .44-caliber single-shot derringer pistol into the back of Lincoln’s head. After stabbing Rathbone, who immediately rushed at him, in the shoulder, Booth leapt onto the stage and shouted, “Sic semper tyrannis!” (“Thus ever to tyrants!”–the Virginia state motto). At first, the crowd interpreted the unfolding drama as part of the production, but a scream from the first lady told them otherwise. Although Booth broke his leg in the fall, he managed to leave the theater and escape from Washington on horseback. 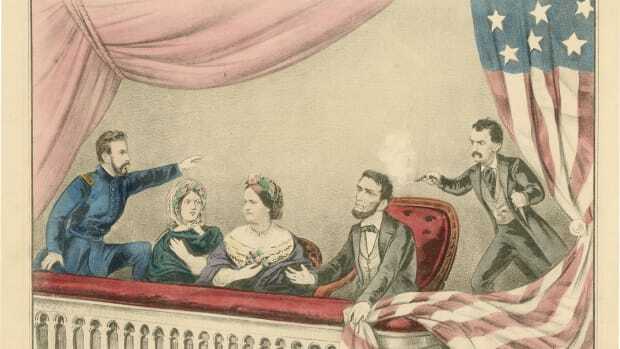 A 23-year-old doctor named Charles Leale was in the audience and hastened to the presidential box immediately upon hearing the shot and Mary Lincoln’s scream. He found the president slumped in his chair, paralyzed and struggling to breathe. Several soldiers carried Lincoln to a boardinghouse across the street and placed him on a bed. When the surgeon general arrived at the house, he concluded that Lincoln could not be saved and would probably die during the night. Vice President Andrew Johnson, members of Lincoln’s cabinet and several of the his closest friends stood vigil by the president’s bedside in the boardinghouse. The first lady lay on a bed in an adjoining room with her eldest son Robert at her side, overwhelmed with shock and grief. 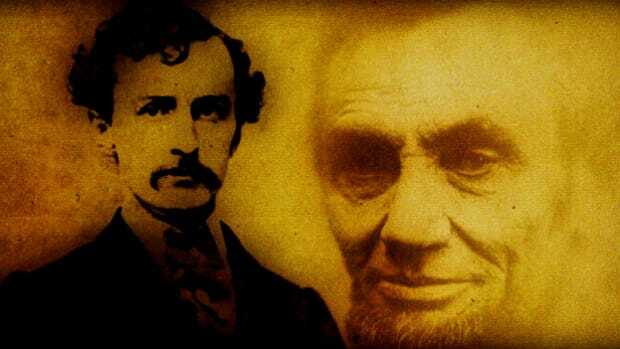 Finally, Lincoln was pronounced dead at 7:22 a.m. on April 15, 1865, at the age of 56. The president’s body was placed in a temporary coffin, draped with a flag and escorted by armed cavalry to the White House, where surgeons conducted a thorough autopsy. During the autopsy, Mary Lincoln sent the surgeons a note requesting that they clip a lock of Lincoln’s hair for her. 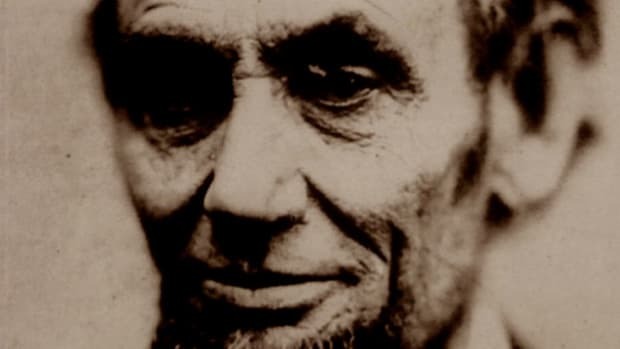 News of the president’s death traveled quickly, and by the end of the day flags across the country flew at half-mast, businesses were closed and people who had recently rejoiced at the end of the Civil War now reeled from Lincoln’s shocking assassination. 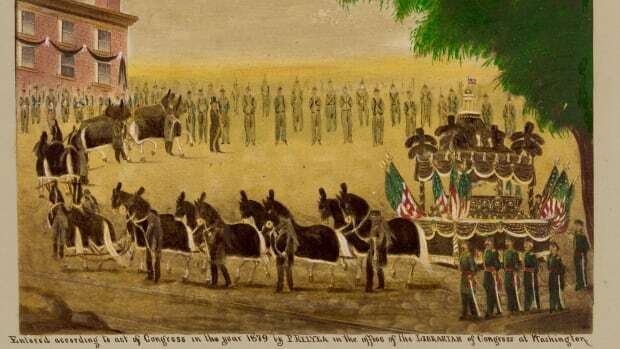 On April 18, Lincoln’s body was carried to the Capitol rotunda to lay in state on a catafalque. 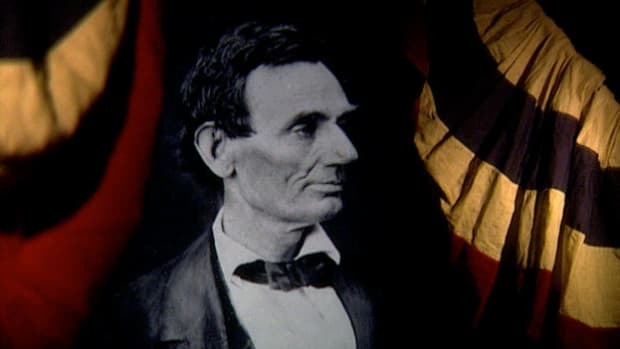 Three days later, his remains were boarded onto a train that conveyed him to Springfield, Illinois, where he had lived before becoming president. Tens of thousands of Americans lined the railroad route and paid their respects to their fallen leader during the train’s solemn progression through the North. Lincoln and his son, Willie, who died in the White House of typhoid fever in 1862, were interred on May 4, 1865, at Oak Ridge Cemetery near Springfield. As the nation mourned, Union soldiers were hot on the trail of John Wilkes Booth, who many in the audience had immediately recognized. After fleeing the capital, he and an accomplice, David Herold, made their way across the Anacostia River and headed toward southern Maryland. The pair stopped at the home of Samuel Mudd, a doctor who treated Booth’s broken leg. (Mudd’s actions earned him a life sentence that was later commuted.) They then sought refuge from Thomas A. Jones, a Confederate agent, before securing a boat to row across the Potomac to Virginia. On April 26, Union troops surrounded the Virginia barn where Booth and Herold were hiding out and set fire to it, hoping to flush the fugitives out. Herold surrendered but Booth remained inside. As the blaze intensified, a sergeant shot Booth in the neck, allegedly because the assassin had raised his gun as if to shoot. Four of Booth’s co-conspirators were convicted for their part in the assassination and executed by hanging on July 7, 1865. They included David Herold and Mary Surratt, the first woman put to death by the federal government, whose boardinghouse had served as a meeting place for the would-be kidnappers.